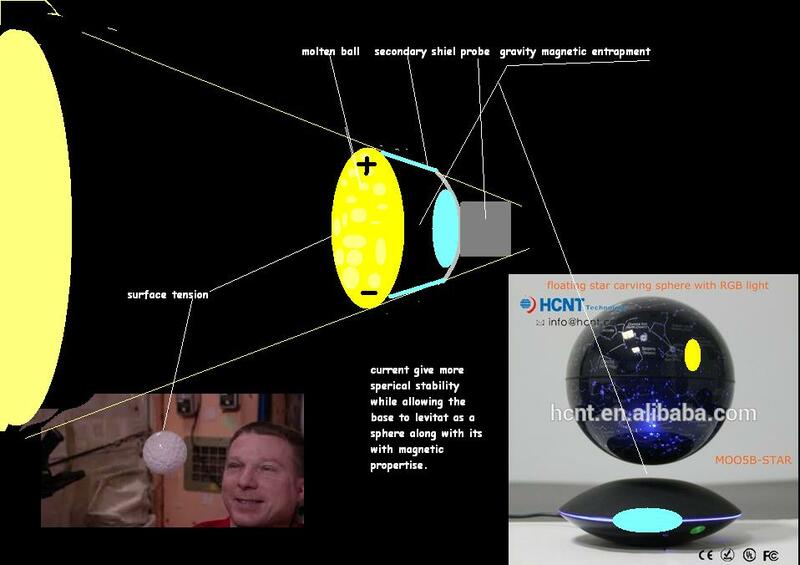 Could an alloy of hot or cold liquid metal be made magnetic by adding electricity to the molten ball to give it magnetic properties to wirelessly attach it to a space craft to use as a shield shown in the 3rd picture? What is the shielding capability of liquid metal compaired to solid metal? https://www.geek.com/geek-cetera/this-is-how-you-melt-metal-with-magnets-1544652/ Shows how hot liquid metal can still have magnetic properties. Ferrofluid Source: Reddit Oil firming from applying artificial magnetic field. Could liquid metal be made ferromagnetic by externally inducing an internal magnetic field? No. Metal is either ferromagnetic or not; this is a result of the quantum-mechanical interaction of neighbouring atoms in the metal's crystal lattice. Even non-magnetised iron at room temperature is ferromagnetic, only, the Weiss domains are randomly oriented and mostly cancel out, which can be changed by applying an external field to orient them all in the same direction. Most other metals aren't ferromagnetic and an external field can't do anything about this: there are no magnetic domains that you could align in some way. And as Uwe commented, even the ferromagnetic metals are only ferromagnetic below the Curie temperature. This always lies below the melting point, so no: liquid metals can not be made ferromagnetic. Regarding ferrofluids: yes, those are ferromagnetic liquids, but they aren't liquid metals. In vacuum, the carrier would quickly freeze and/or evaporate. Paramagnetism is similar to ferromagnetism, except you don't have mesoscopic magnetic domains that could be aligned, but only microscopic spins of single atoms or molecules. Thus, paramagnets are attracted to magnets similarly as ferromagnets are, just much weaker. Many materials are paramagnetis, including liquids. Often they aren't metals, e.g. liquid oxygen is an example. Diamagnetism is even weaker, and has the opposite effect: diamagnets are repelled by an inhomogeneous magnetic field. Induction. Any conductor, and thus any metal even if liquid, will respond to a time-variable magnetic field: such a field generates currents, and those currents will broadly speaking reject the field-change. And this can indeed be used to move/shape the conductor without touching it. It is mostly important for plasma (conductive gas), and is the working principle behind Tokamak and Stellarator fusion reactors. So, induction is your best bet. Could this be used to form a shield? Possibly. In fact fluid conductors have a natural tendency to form sheet-like structures. Whether this is practical is dubious, but it's in principle a worthwhile idea. Not the answer you're looking for? Browse other questions tagged spacecraft interplanetary the-sun shielding design-alternative or ask your own question. What is the vapor pressure limit of liquid metals in space? Proposed methods to use electromagnetic force to replace gravity beyond boots? Does NASA have spacecraft that are specifically made for orbiting around the Sun? Could BNNTs be used for Whipple Shield designs? What is a safe speed in space for spacecraft? How would molten or liquid metal be transported in open space?